The last completed film from Raúl Ruiz (Time Regained), Mysteries of Lisbon plunges us into a veritable whirlwind of adventures and escapades, coincidences and revelations, sentiments and violent passions, vengeance, love affairs, all wrapped in a rhapsodic voyage that takes us from Portugal to France, Italy, and as far as Brazil. In this Lisbon of intrigue and hidden identities, we encounter a series of characters all somewhat linked to the destiny of Pedro da Silva, orphan in a boarding school. Father Dinis, a descendent of the aristocratic libertines, later becomes a hero who defends justice, a countess maddened by her jealousy and set on her vengeance, a prosperous businessman who had mysteriously made his fortune as a bloodthirsty pirate; these and many more all cross in a story set in the 19th century and all searching for the true identity of our main character. Later a sx-part TV mini-series, The Mysteries of Lisbon was released theatrically in 2010 as a 266-minute feature (yep, that's almost four-and-a-half hours) and won a number of international awards, including three Portuguese Golden Globes for Best Actor (Adriano Luz), Best Actress (Maria João Bastos) and Best Film. 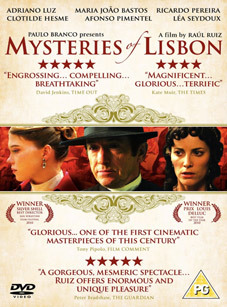 Described by Sight & Sound as "a magisterial four-hour saga set in 19th-century Portugal that serves as a fittingly elegant summation of [Raul Rúiz's] life's work," The Mysteries of Lisbon will be released on UK DVD by New Wave Films on 12th March 2012 at the SRP of £22.99.